These waterfalls are along the Big Wapwallopen Creek. The area is called the Powder Hole because it was home to a mill that produced black powder. (The Powder Hole is on private property and is posted, "No Trespassing.") 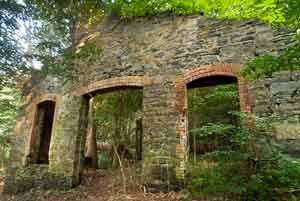 The mill operated from before the Civil War, about 1855, into the twentieth century , around 1913. The primary customers for the powder were the local coal mines. While the whole area is the Powder Hole I've broken the area into two parts. First the area around the old Power House (see picture at the right) I've called the Powder Hole (see the graffiti on the remains of the railroad trestle in the picture below). Above that area are a series of three falls, The Upper Falls. Some call this set of waterfalls, Johnnoha Falls. Please note that the Powder Hole is on private property and is posted, "No Trespassing."